Entrepreneurial fintechs decreasingly see themselves as competitors with large financial institutions, but rather as partners in a large, highly regulated marketplace. However, collaboration between financial institutions and fintechs remains a challenging and time-consuming process. Tactical hurdles are slowing smooth and efficient technology adoption by established financial service providers. If they can overcome these challenges, both fintechs and Financial Institutions stand to benefit. STRUCTURE THE PROCESS AND PEOPLE-- Create a map to chart the process and designate a leader for each phase. STREAMLINE AND SIMPLIFY CONCEPT DECISION-MAKING-- Practical steps can speed the process of getting to a “go” or “no go” decision on proof of concept. CREATE SANDBOXES TO FACILITATE PROOF OF CONCEPTS-- Sandboxes, safe work areas to test concepts using simulated feeds and masked data in a sequestered environment, are already increasing speed and efficiency in the financial institutions that have provided them to fintechs. PRIORITIZE REGULAR, TIMELY TWO-WAY COMMUNICATIONS--Financial institutions and fintechs perceive their working worlds differently for natural reasons based on size, regulation, bureaucracy, cash flows and other factors. Building in good communications channels and awareness of each other’s needs will drive the fintech-financial institution relationship toward greater success. Sunny Parikh is a Vice President at the Partnership Fund for New York City, a $170 million venture capital fund founded by Henry Kravis. As an evergreen fund, all of the Fund’s profits are reinvested in other New York organizations that catalyze the growth of new industries and open opportunities for all New Yorkers. 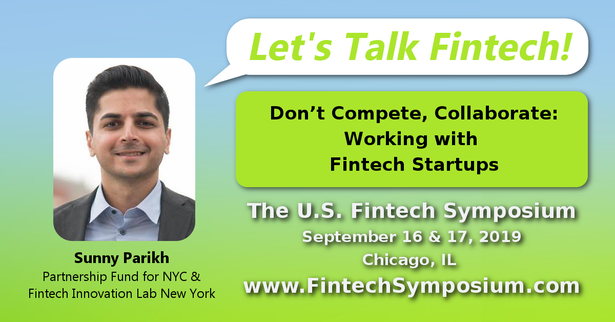 As part of his role at the Partnership Fund, Sunny leads the FinTech Innovation Lab, where growth-stage technology companies collaborate with senior executives from 43 leading insurance companies and financial institutions. Previously, Sunnywas Director of Strategy & Finance at RedVision, a real estate technology company sold to First American. Prior to RedVision, Sunny was part of the investment team at Updata Partners focusing on growth-equity technology companies. Sunny began his career as an Investment Banker at ThinkEquity Partners. He is a graduate of the Kelley School of Business at Indiana University.